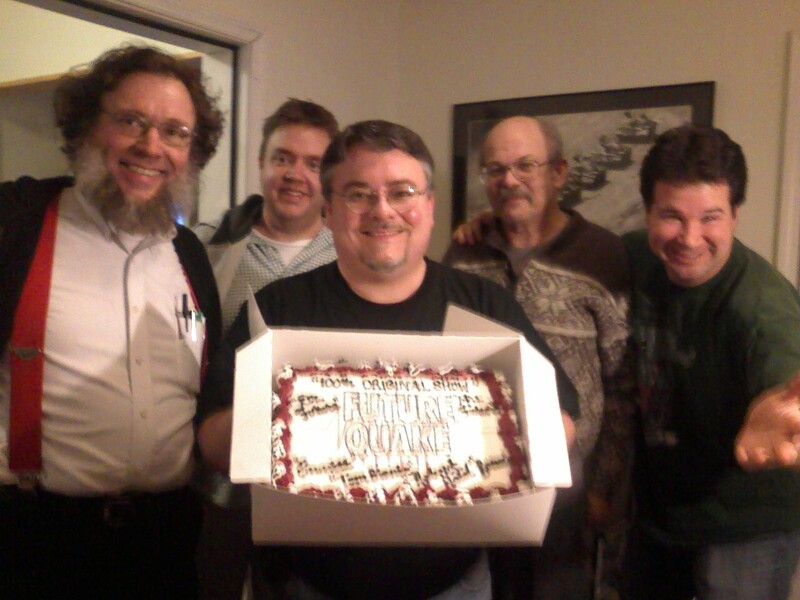 This says it all - March 4, 2008 was the live broadcast of the 100th Original Show of "Future Quake", which broadcast its first weekly show on April 5, 2005. That night was like a family reunion, with old friends stopping in to visit the studio and on the phone (such as Tom Horn, Mish, "The Sandman", and Frank and Jane Fileccia), as we reminiscenced over events on the show over the last three years. Much thanks to Mrs. Future for taking the pictures with her cell phone camera (sorry if they are a little blurry), and Publix in Goodlettsville, TN for the great work on the cake. Three keys to the success of "Future Quake": Robert Heid (one of our favorite and prolific guests, and the first one ever, in fact!) 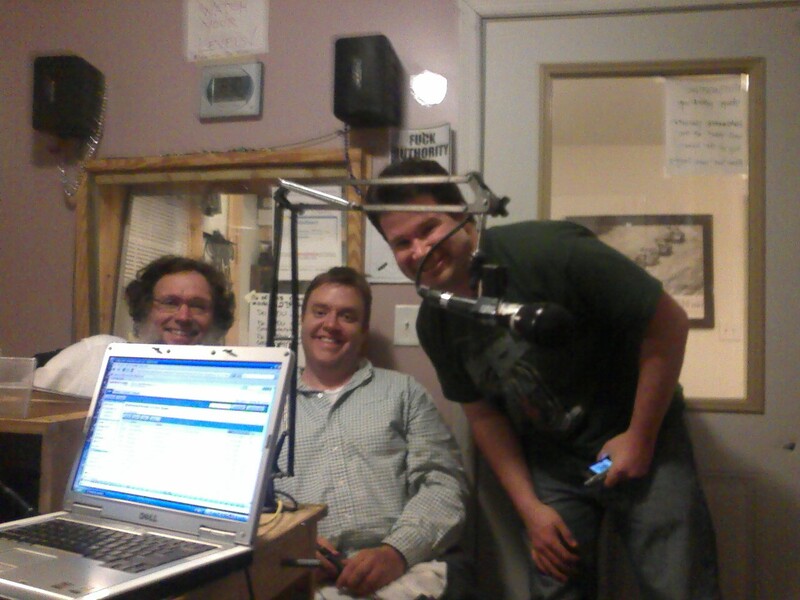 on the left, the beloved Emmitt (first co-host of the show, for 18 months) in the center, and Tom Bionic (current co-host since the beginning of 2008) on the right, in the WRFN studio. The same gang, also including WRFN Program Director Beau Hunter. 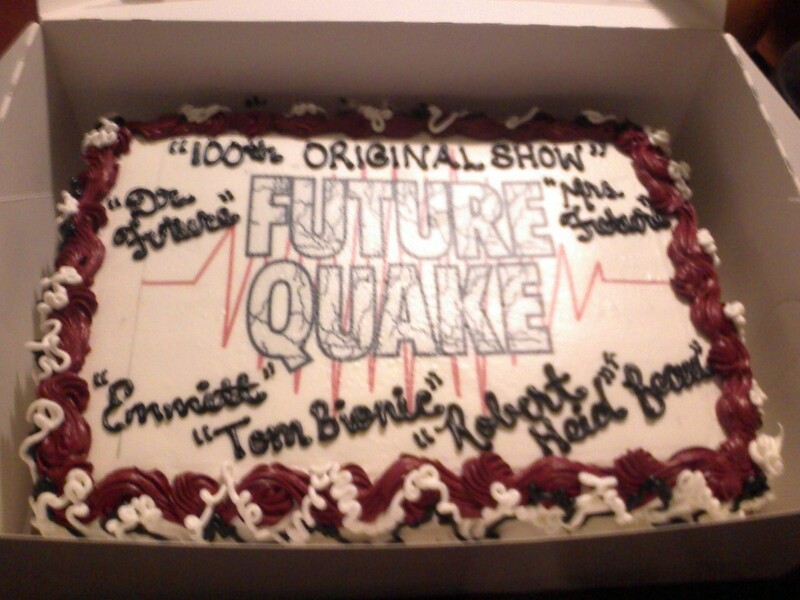 Thank you so much, listeners, for making "Future Quake" a big success!